I have been a collector of classic cars for 35 years. This is one of my classics from my personal collection, see others at, WWW.GCCC.US This car was originally a 327/365hp 4 Sp, with Factory A/C but the previous owner changed it to a ZZ430 GM Performance Division Commemorative Edition Motor. This work of art produces 430HP / 430LB Ft. Torque and is 306 of only 430 ever built. Estimates show that the ZZ430 cost originally around $10,000 to $12,000 alone. You for sure get that Big Block rumble that only a BB can provide. This car has al the looks and performance of a true Big Block car for a lot less cost. Of course you could always find a correct short block(casting and date) and have it stamped with the cars vin and original motor configuration and wall la. However if you were to drive this car with the ZZ430 in it you would NEVER change it out. -Original Alloy Wheels With Knock Offs -Original Side Pipes (What A Thunderous Sound) -Mileage - I have no way to determine the exact mileage, However the odometer is in full working order and has the above stated miles. All of the electronic components as well as all the lights work just as they would have in 1964. This Includes The Clock, Radio, Interior Lights, as well as the Headlights. This Corvette was restored between 1998 and 2000. At that time all of the interior, chrome, carpet and molding were kept due to their condition (better to keep original than replace with foreign made replacements). The car dash has a couple of minor cracks and the carpet has faded just a bit. Please see the detailed photo's included. The speakers have been replace with something a little more modern. The hood was also replaced with a 1967 hood for the look of a "Big Block" car. Most people mistake the car for a Big Block 427 just by pulling up next to them with the hood cowl with the stripe and also the thunderous sound. Again, this is an all original 1964 Corvette Convertible with the exception of the ZZ430 GM replacement motor and original 427 BB hood. I have an original 1964 Corvette(off my 64 corvette circa 1966) hood that I would gladly trade a buyer for the BB hood on the car now,. 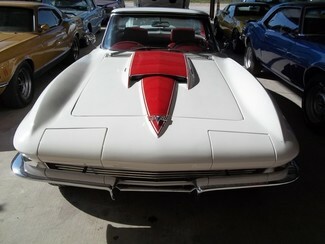 This car is in outstanding condition and has had a completely new professional repaint($14,590. ), in the original factory color Ermine White in base coat clear coat as well. Included are the original Owners Manual's as well.